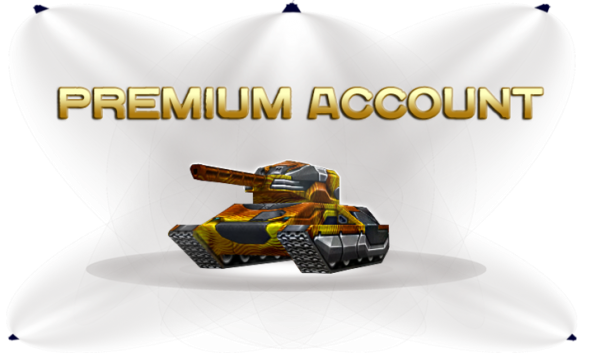 Premium account is a paid service which gives bonuses and privileges to its owner. The service appeared in the game on the 21st October 2015; and is available for purchase at any rank. Getting a Premium Account is possible by winning Contests, randomly getting it from a Container, or by buying with real money in the Shop. To do this, you must go to the special menu, indicated by the icon on the upper panel on the main game interface. After receiving the Premium status, a new item called "Premium Account" will appear in your Garage, under "Special" items' section. In its description you can find information about the remaining Premium days. Before the Patch Update #493, the visibility of the Premium account icon to others (rank icon and bonus reward) could be turned on and off. However, the option to do that has now been removed. 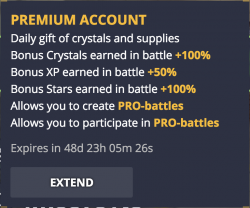 If you already own a Premium account and you buy crystals or extend its duration, the extra Premium days will be added to the remaining Premium days you have. Thus, the Premium can be extended in advance, without needing to wait for its expiration. You will receive a notification informing you that your Premium will end soon on the last days of its duration. At the moment of its expiration you will get a reminder that all Premium options have been deactivated. Special rank icon. Visible only to yourself. In the "Reward" column you will see the amount of crystals you've earned from the battle. 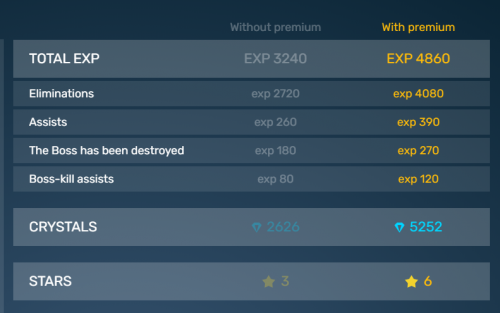 Also, Bonus crystals obtained by using Premium Subscription is not connected to the battle fund in any way. Note: As of 27th July, 2018, the bonus crystals earned from a Premium subscription at the end of the battle now appear in the "Reward" column as a whole. They are added with the original amount of crystals earned from the battle. Premium paint - which is only available to owners of Premium status while their Premium is still active. The paint is removed from the Garage as soon as Premium subscription is over. Daily bonuses that include 2500 crystals, 3 repair kits, and 10 of each of the other supplies (excluding Gold Boxes).